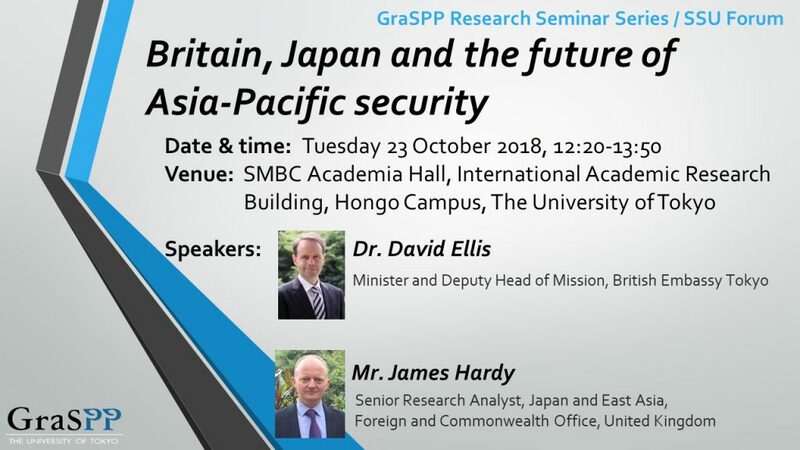 On October 23, 2018, GraSPP was delighted to host a seminar on Britain, Japan and the future of Asia-Pacific security with Dr. David Ellis, Minister and Deputy Head of Mission of the British Embassy to Japan, and Mr. James Hardy, Senior Research Analyst for Japan and East Asia at the British Foreign and Commonwealth Office. 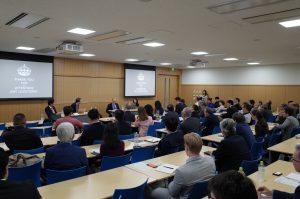 The seminar, organized in collaboration with the Security Studies Unit of the Policy Alternatives Research Institute, was chaired by Professor Yee-Kuan Heng and moderated by Professor Chiyuki Aoi. 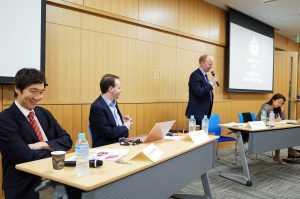 Dr. Ellis discussed in detail how history and geography have shaped Japanese security choices similarly to those of the UK. Both countries, as isles and developed liberal democracies, share an interest in upholding the rules-based international order and counter those who challenge it. North Korea, for instance, poses a severe challenge to international norms with its contravention of the Treaty on the Non-Proliferation of Nuclear Weapons and development of ICBM capabilities. 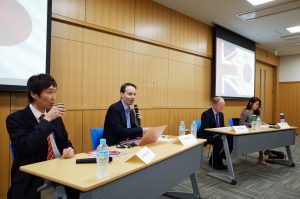 Dr. Ellis affirmed that for the UK, like for Japan, there must be complete, verifiable, and irreversible denuclearization of the Korean peninsula. He also suggested that the UK, given its expertise on nuclear weaponry, could play an important role when DPRK decided to denuclearize. Dr. Ellis also presented other challenges faced by Japan and the UK in the region. For instance, he pointed out at the rapid development of Chinese defense capabilities, particularly those in the areas of hypersonic ballistic missiles and antisatellite missiles technologies. These bleeding-edge technologies, mixed with a stronger military relationship between China and Russia, could challenge the regional balance of power and pose a risk to regional security. For this reasons, Dr. Ellis hopes that the UK will cement stronger ties with Japan. In this direction, he welcomed the recent intergovernmental meetings, the annual strategic dialogue meetings, the joint thematic dialogues, and the increasing collaboration in the defense sector. He also remarked that with the ‘Exercise Vigilant Isles,’ the UK has been the first country, besides the US, to hold joint exercises with the Self Defense Forces on Japanese soil. Mr. Hardy followed up Dr. Ellis and explained how the UK and Japan partnership will play an increasingly relevant role in the future. He argued that we live in a period of ‘hot peace’ where national interest and geopolitics are making a comeback. This is reflected, in his opinion, by China’s assertive foreign policy. Mr. Hardy argued that since 2008 China had proven that it is willing to use its economic power as an instrument of statecraft and its navy as a tool of power projection. In this scenario, the UK, like Japan, is interested in upholding maritime rule of law. At the same time, the UK is also committed to the Indo-Pacific region due its historical legacy and commitment to the Five Powers Defence Agreement and Brunei. Looking forward, Mr. Hardy sees the UK playing a key role in Asia-Pacific security via minilateral arrangements and a consolidation of its partnership with Japan.